Inspired by cutting-edge design, we are your source for custom stamps and embossers not found anywhere else. Our clean, sophisticated designs add flair to return address stamps, social stamps and more. Our custom stamps are laser engraved rubber, which guarantees a perfect impression every time. Upload your own stamp design and create your own collection! Using our preview technology, you can upload your design and preview it just as it will appear on your stamp. 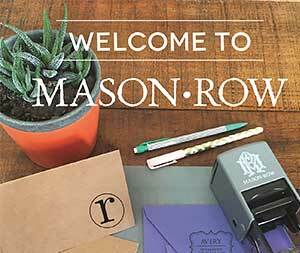 A custom embosser from Mason Row adds an elegant touch to everything from stationery and envelopes to bookplates, foil seals, recipe cards, cocktail napkins and invitations. Follow us on social media by clicking the icons below or find us on Facebook, Twitter, Pinterest and Instagram using @masonrowdesigns. Don't forget to sign up for our newsletter to stay up to date on new products and special offers!